September 14, 2018, Adrian, Michigan – Retired Adrian Dominican Sisters residing at the Dominican Life Center (DLC), along with DLC Administrators, Chaplains, and Co-workers, blessed a place of beauty, friendship, and restoration on September 6: the newly renovated DLC Beauty Salon. 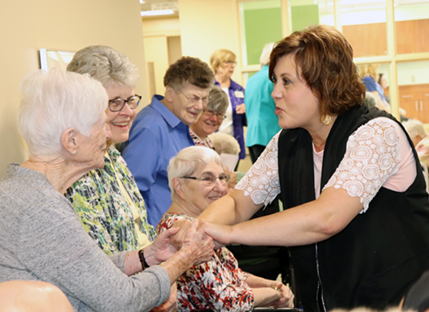 During the blessing ritual, Beauticians Lisa Schneider and Chris Iott walked through the crowded hallway outside of the beauty salon, accepting the blessing of touch from each Sister in the assembly. Beautician Chris Iott walks among the Sisters to have her hands blessed. With the help of donations from benefactors, the former beauty shop at the DLC was relocated to a larger space next door. The new beauty salon was updated with styling chairs and height-adjustable shampooing sinks that can be accessed from a wheelchair, mirrored salon stations, and dryers. Cheryl thanked all the people who were involved in the renovation of the Beauty Salon: Jan Perry, DLC Administrative Assistant, who “worked tirelessly to find just the right equipment;” the beauticians, Chris Iott and Lisa Schneider; Sister Carol Fleming, OP, for her “artistic insight;” Joel Henricks, Director of Facilities and Grounds, who served as project manager, working with Krieghoff-Lenawee Construction; Nilda Rau, Director of Resident Services; and Amy Palmer, Director of Development, who reached out to benefactors to provide funding. Feature photo at top: Jennifer Jenkins, Chaplain and Pastoral Minister, blesses Sisters Betty Gaiss, OP, and Marion O’Connor, OP, during the dedication of the Dominican Life Center Beauty Salon. View more photos of the Beauty Salon on our Instagram page. June 26, 2018, Green Bay, Wisconsin – The Adrian Dominican Congregation received four awards from the Catholic Press Association for videos, website content, the 2016-2017 Annual Report, and its Christmas 2017 social media campaign. The awards were announced at a Catholic Press Awards Banquet June 15, 2018, at the end of the Catholic Media Conference, “Touchdown in TitleTown,” held June 12-15 in the KI Conference Center in Green Bay, Wisconsin. The awards earned were the result of collaboration over the past year among the offices of Communications, Development, Technology, and Vocations. "Preach with Your Life," a series of videos produced as vocations outreach, won second place for Best Freestanding Presentation of Online Video: Depiction of Religious Life. First place went to the Catholic News Service. Recognized for this project were Sisters Lorraine Réaume, OP, and Sara Fairbanks, OP, of Formation and Vocations; Scott Miller, of Technology; and Ashley LaVigne, Angela Kessler, and Sheila Wathen, of Communications. “Hope,” a prolonged social media Christmas fundraising appeal, which ran from November 28, 2017, through December 29, 2017, took second place for Best Social Media Campaign. The HOPE Campaign consisted of a series of five videos, which were posted on Facebook, Twitter, and YouTube and sent to donors in a series of emails. “This campaign uses compelling videos with a consistent brand experience,” the judges commented. “It is no surprise that last year’s fundraising achievements were exceeded!” Co-workers involved in this appeal included Scott Miller, Technology; Amy Palmer, Development; and Ashley LaVigne, Angela Kessler, Sheila Wathen, and Jessica Havens, Communications. “Counting our Blessings,” the 2016-2017 Annual Report for the Adrian Dominican Congregation, received honorable mention in the category of Best Annual Report for a Catholic Nonprofit Organization. Among those involved in producing the Annual Report were Amy Palmer, Development, and Angela Kessler, Sister Barbara Kelley, OP, and Jessica Havens, Communications.